For over 100 years, shipbuilding has been a leading industry cluster in Door County. 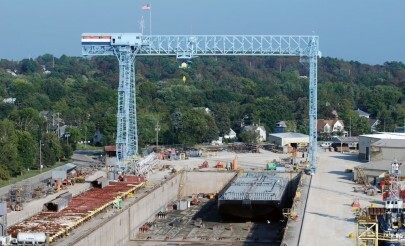 In 2004, DCEDC, in partnership with the City of Sturgeon Bay, Boldt Technical Services, Bay Shipbuilding Company and Palmer Johnson Yachts, released the findings of the Sturgeon Bay Shipbuilding Cluster Master Plan, developed to address the future infrastructure needs of the Sturgeon Bay shipbuilding companies. On December 31, 2008, the Italian company Fincantieri completed its purchase of the Manitowoc Marine Group, which includes Bay Shipbuilding Company. The Sturgeon Bay City Council approved a Development Agreement with Fincantieri Marine Group/Bay Shipbuilding Company to release $6 Million in State Harbor Assistance grant funds for construction of the first section of a new floating dry dock, about 200 feet of the eventually 650 foot dock facility. Bay Ship will complete construction of the remainder of the dock by the end of 2012. FMG/Bay Ship also constructed a new 3,500 square foot weld training center and a 17,000 square foot pipe shop in the shipyard. FMG/Bay Ship also recently announced that they have been approved for a $2.8 Million federal economic stimulus grant. They will provide a 25% match for the grant that will fund new manufacturing equipment; DCEDC assisted with the grant application. Overall, Fincantieri has committed $7.8 Million for capital improvements at Bay Ship in 2009. View a summary of the Sturgeon Bay Shipbuilding Cluster Master Plan.